It is the dwarf version of Quick Fire®. 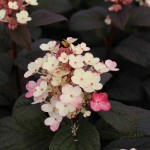 It is an early blooming selection with white flowers that age to pink-red. The fall foliage takes on purple tones. It prefers full sun to partial sun, and moist, well-drained soil. It flowers on new wood. 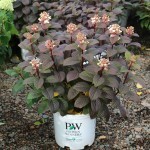 Use it in the shrub border, for mass plantings, in containers.